The Greek language of the New Testament is rich in detail, expressive and full of meaning, and, in A Word for the Day: Key Words from the New Testament, J.D. Watson brings New Testament Greek to life. 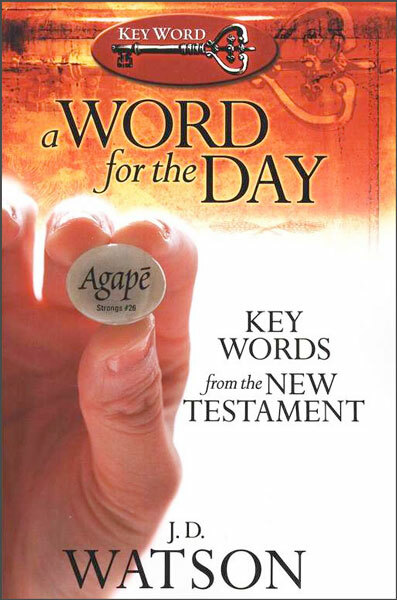 Each devotion in this resource briefly presents a Greek Word (along with its Strong's number and transliteration) and offers a practical application for that particular word. The entries also have scripture references for study. Words, especially the words of the Bible, have meaning. In a world that embraces relativism, God's Word and the absolutes it declares, are sorely needed. The devotions of A Word for the Day will enable readers to know God's Word and the power, faith and wisdom it grants to those that hear it. A Word for the Day includes the KJV Strong's roots and Strong's Enhanced Dictionary so that readers can take full advantage of the riches of New Testament Greek. In keeping with the start of a new year, nothing could be more appropriate than to consider what the apostle Paul calls the new man (Eph. 2:15 ; 4:24). The two Greek words are kainos anthropos, and they are truly significant. One word translated new is neos (2537), which "refers to something new in time, something that recently has come into existence." The one here, however, is kainos (2537), which "refers to something new in quality," as it would be distinguished from something that is old and worn out. J.D. Watson currently pastors Grace Bible Church in Meeker, Colorado. He writes and edits the monthly publication Truth on Tough Texts, and desires for the Word of God to be the source of authority in all matters. A recent update fixed the hyperlinking error to the Strong's numbers in the text. The necessary dictionaries are included in the download. If you have previously purchased this resource, you may download the updated files for free by logging into your Personal Library.